It was a day of firsts. In the first of more to come, the PATC - Charlottesville Chapter and PATC - Southern Shenandoah Valley Chapter embarked on a joint hike with subsequent potluck and optional stay at PATC's Conley Cabin in the 300 acre Vining Tract. Not just the first joint hike, but this was also the first organized hike on this property. 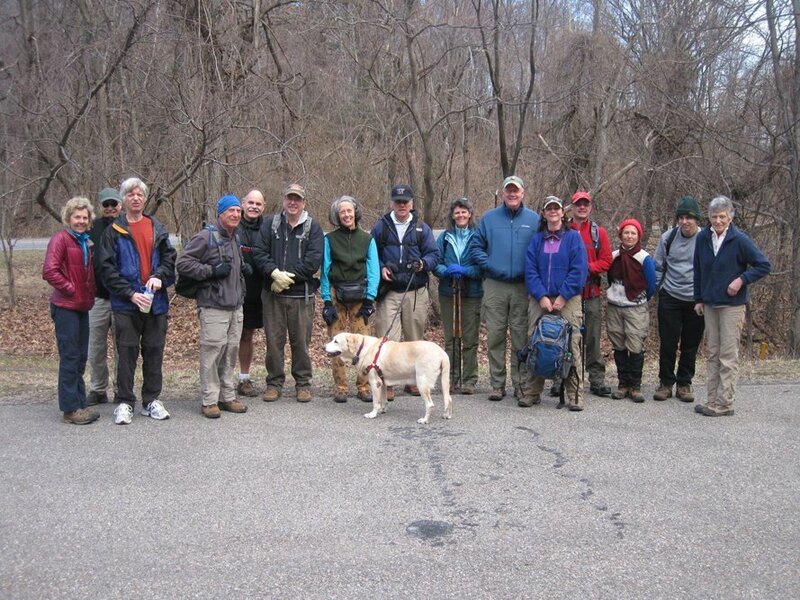 Perfect weather for hiking, in the 60's with sunny skies, as hike leader extraordinaire Iva Gillet greeted 21 hikers with the accompaniment of 3 canine hikers this day. We began our 5 1/2 mile loop along the Boundary Trail with a climb and found that we will need to return for some trail clearing due to several blow-downs along the trial. We then descended the trail toward Mutton Top Cabin and made a side trip to a hidden cemetery that trail map volunteer Bill Holman had discovered earlier. Passing Mutton Top, we stopped by an impressive chimney on our way to Johnson Cabin. After a brief trip to an unmarked overlook, Howard and June Ratcliffe headed to Conley for lunch since they needed to return early. Water was gushing from rocky cliffs as we proceeded on an old CCC road toward an unmarked trail that would take us toward the Vining Cabin. There was some grumbling as we ascended a very steep section of trail and then descended on an equally steep downhill with water flowing though the trail. However, the views and beauty of the day made up for the challenge. We had a lunch break beside Caddies Run in Falls Hollow, a flowing stream where Ken Moss found a red salamander. Brian Muszynski and Beulah sighted a bear as they were out front. After a peaceful waterside break, we continued on to the Vining Cabin. As no one was in residence, we were able to walk around the lovely home and enjoy the view from the porch. During this break, Beulah and Tom Johnson's clever dog, Sam, retrieved sticks for whoever would throw them. After admiring the setting and amenities of the Vining Cabin, our group proceeded onward for the final climb. We twisted our way up the mountain toward Conley and the side trip to Morris cabin was abandoned for the thought of a cold beverage on arrival at the cabin. While Marie Moss and Michelle Faragan departed for an early return trip to Charlottesville, the rest of us gathered potluck items and our beverages and enjoyed the view and camaraderie. It was a great opportunity for Michael Seth and Jean Fraser to compare hiking exploits with Tom Johnson, Karen Ramsey, and Bryan Bruns. We were able to persuade Marian Styles and Andy Willgruber to stick around before departing for their evening commitments (Andy's stash of dark chocolate was the deal clencher for Marian). Chapter presidents Lindsay Brown and Karen Waterman were able to discuss their PATC leadership challenges. Dan Ralston and Ken Moss were seen appreciating the taste of a good brew after a good hike. Jim Stephens had guarded the cabin all day, while reading, and was on hand to spearhead the grill. Teresa was cabin hostess as she is recovering from a hurt knee. Many hands helped organize the feast and we were well underway when Mark and Betty Gatewood emerged from their water bar work trip. John Shannon, never satisfied if there is work still to do, arrived later to enjoy the fun. Bev and Pete Fink provided bean salad, while Don Davis' deviled eggs were also popular. As the sun began to set, those who remained were able to enjoy the amazing view from Brian Muszynski's telescope. He was able to find Monticello before the sun set. With the full moon rising, we were given close appreciation of the rabbit image on the moon and its radiance. We hope to enjoy future fellowship of joint hikes and other cabin stays. It's the best part of the PATC! The Flying McLeods started their 4th season on the trail leading to Hightop in the northern part of the southern district of Shenandoah National Park. It was the usual foursome of Mark Gatewood, Al and Andre Dahler and John Shannon who went to rehabilitate water bars on this section maintained by Radar, a person only seen maintaining trails, but a recent illness has prevented him from getting out. We cleaned some waterbars, reset logs for several, replaced the log for one and completely remodeled one rock waterbar. Also in a few spots we made little runoffs where the shape of the land suggested we could easily drain water off the trail. We did a little tree and branch clearing also. At lunch, we all enjoyed pumpkin cake. By now, the wind died down so we experienced the expected pleasant temperatures. On the way out, Mark Gatewood counted 43 places where we improved drainage. During the day we saw several people. One backpacker trained as a marine biologist in Townsville and therefore recognized an Australian; two trail maintainers who admired our waterbars, and have problems with theirs because of the many rocks on their section; one couple who recognized and thanked us as volunteer maintainers. Today also realized there are items which would help us, but not even Google can find; non-stick McLeods; a trail roller to give a smooth finish to water bars (once procured, I wonder if this heavy off-road moving object would appeal to our former tank commanders). I also needed Kevlar pants for trail work for protection against saws which slip out of place. After stopping work on waterbars, I went to a section of AT north of Doyles River to see what works needs to be done that is too heavy for overseer Connie Wright. There were no fallen trees, but as expected, waterbars needing clearing. A number had definitely caught some debris. When we clean them, we will probably look at some remodeling to see if more debris can be diverted off the trail to reduce future cleaning. I spent some time cutting some bittersweet in the hope of saving some trees from strangulation. I noticed how one patch we have been clearing seems to have little bittersweet growing into the trees and shrubs, but spring may reveal more plants on the ground hoping to grow up into trees. After looking and cutting, I headed to Conley Cabin to dine with other members on the Charlottesville and Shenandoah Valley Chapters. Today's hike was originally planned as a makeup date from a hike originally postponed from January 8, when Skyline Drive was closed due to snow and ice. The weather had an impact on this excursion as well, though, but it wasn't a problem of the Drive being closed that caused a disruption. Rather it was an overabundance of that which has been too rare in our region over the past several years...rain. With over 5 inches of rain in the Charlottesville area in the last week, water levels were high throughout the region, with flooding in some low areas. At Jarman Gap before hitting the trail. This situation had caused serious consternation for hike leader Ken Moss for the previous couple of days, as he saw local streams flooded and during a trail maintenance trip into the Park on Friday had seen the rare sight of water freely flowing down what are normally dry gullies above Skyline Drive. All of those smaller flows were certainly meeting lower down the mountain to form ever larger streams of rushing water, with yet lower areas likely to be formidable torrents, likely making crossings difficult. Pre-hike anxiety over this situation caused the hike leader to contact the Chapter's Dean of Hiking Experience, John Shannon, to inquire as to his considered opinion on the feasibility of crossing the Turk Branch and South Fork Moormans River on the lower sections of our planned itinerary. His learned opinion could essentially be boiled down to indicate "maybe". Heading north on the AT from Jarman Gap. Thus a group began gathering in the parking lot of Albemarle High School on Saturday morning, wondering what awaited us on the trail. The weather forecast promised mostly sunny skies and high temperatures in the 50's at higher elevations, but it was still chilly and somewhat overcast as 16 hikers embarked on the drive to Jarman Gap, though we noticed clear skies to the west. Among the group was newcomer Lossie Wilkerson and OASC member Alex Pepkin, accompanied by our own Iva Gillet and Dan Ralston, who were doing some leader qualification training for OASC. Arriving at the Jarman Gap parking area it was still gray and cool. Scenic pause at Sawmill Run Overlook. Descending briefly from Jarman Gap on the South Fork Moormans River Fire Road, we soon turned north on the Appalachian Trail where we quickly heard and saw the gurgling upper reaches of the river, normally little more than a trickle at this elevation. Further along the AT we noticed trail erosion and water freely flowing along the trail in at least one spot, as we walked along the increasingly active stream, which had spread out into several channels as it gathered strength from feeder streams. Across the Moormans River Valley we had fine views of Bucks Elbow Mountain as we started climbing along the eastern edge of the Blue Ridge, leaving the river behind as the sun finally broke through and warmed us. We eventually reached a more level section of the AT and crossed Skyline Drive at Sawmill Run Overlook, providing views of Sawmill Ridge, the Shenandoah Valley and our destination, Turk Mountain. After a brief, windy stop to admire the view, we continued north on the AT, crossing through a more open area with scrub pines providing further views of the rocky crest of Turk Mountain, during which Leon Gorman, his faithful companion Bailey and Lossie Wilkerson turned around to return to their car for a shorter day on the trail. The rest of the group eventually reached the Turk Mountain Spur Trail just south of Turk Gap. We took this mile-long trail down through a saddle between the backbone of the Blue Ridge and Turk Mountain before climbing to the summit for a well deserved lunch top with fabulous views of the Shenandoah Valley to the west. During our pleasant, sunny 45-minute lunch break at the summit we met another group which had already attempted a descent of the South Fork Moormans River Fire Road, having planned to climb back up to the AT on the Turk Branch Trail, effectively following our planned itinerary in reverse. After several difficult crossings of the Moormans on the way down, they eventually reached a crossing that was impassable due to high, rushing water and turned around, retracing their steps back to the AT. They counseled us to abandon any attempt at completing our planned loop hike via the Turk Branch and South Fork Moormans River, claiming that any crossing would be dangerous and very wet. Upon hearing this news, which served to confirm our suspicions, it was determined to abandon the plan and return to Jarman Gap via the AT for an out-and-back hike. Upon returning to Jarman Gap, after having covered a total of about 8.5 miles, there was discussion concerning options to make an attempt at reaching Little Calf Mountain by continuing south on the AT to extend the hike by 5 miles, to just go home or to make a stop at Blue Mountain Brewery for refreshments on the way home. Most hikers felt it had already been a good day and elected to head home, to include John Shannon, Sue Tansey, Dave Borszich, Eileen Seaman, and Don Davis, as well as Iva, Dan and Alex. Hike Leader Ken Moss led a splinter group on a detour to Blue Ridge Brewery accompanied by Barbara Shenefield, Brad Young, Pete Fink and Beverly Moresca. Marit Gay remained on the mountain to do trail work along the AT near the Crimora Lake Overlook. Junction of AT and South Fork Moormans River Fire Road. Though the original plan fell apart due to high water, everyone seemed to feel that the right decision had been made to alter the hike. It turned out to be near-perfect weather once the sun came out and warmed into shirt sleeve temperatures for most. It was still a spectacular trail with great views and a good time was had by all. Saturday's hike to Bear Church Rock started on a cloudy morning, with light rain and hike leader Lindsay Brown wondered if anyone would show up. Well, the question was quickly answered when 13 other hikers arrived at the parking lot. Lunch in a cloud, just below Bear Church Rock. We were happy to have 3 first timers with our group, Karen and Ian Cooper and Martin Henderson...hopefully we will see them again on future hikes. The small parking lot at the end of Route 662 had quite a few vehicles, many were fly fishermen trying their luck, but with a little maneuvering, we were able to get all the cars safely parked. The initial climb was steady and the rain held off as we ascended to the junction of the Stanton River Trail and the Jones Mountain Trail. The hike leader, along with Martin Henderson and Eric Christenson, took the gradual incline to the McDaniel Hollow Trail junction while the others all headed up the steep incline of the Jones Mountain Trail. We all connected at the rock outcropping for lunch and a nice view of the clouds we had been hiking in all morning. Visibility was about 60 feet. Turn around! The "view" is the other dirsection! John Shannon lead a small expedition up to the actual "Rock" which included the Coopers, Sue Tansey, Liz Lyons, Eileen Seaman and Brad Young. John Brandt took his own private trip to the Rock before descending with the others. Not expecting an improved view from the summit and having previously "been there, done that," Dave Borszich, Marian Styles and Ken Moss started back down the mountain ahead of the main group. No wildlife today with the exception of a few dogs on leashes and two horses being ridden at the parking lot, just a good hike with a great group. Welcome to the PATC - Charlottesville Chapter blog! A blog (a contraction of the term web log) is a type of website. Blogs are usually maintained by an individual or a group with regular entries of commentary, descriptions of events, or other material such as graphics or video. Entries are commonly displayed in reverse-chronological order. Blog can also be used as a verb, meaning to maintain or add content to a blog. Our blog is interactive, allowing visitors to leave comments...it is this interactivity that distinguishes a blog from other static websites. Here you will find articles describing recent hikes, Chapter news and other items of interest to members. We hope you will find this new communication method both timely, useful and even entertaining! Besides this blog, another important communication tool used by PATC - Charlottesville Chapter is our webpage, which is where you will find our most up-to-date hike schedule. Please make a point of visiting it often, as new hikes and changes will be posted there. Hint: be sure to bookmark the webpage (or save as a favorite) so that you will be able to navigate to it regularly to check the schedule. PATC - Charlottesville Chapter has produced a newsletter since our earliest days. The format and frequency have changed many times over the years. As new technologies arrived (electric typewriters, photocopiers, word processors, computer printers, email, the internet, etc. ), we tried to take advantage of such capabilities. Yet, though we adapted the newsletter to those technologies over the years, we essentially continued to follow a traditional model of assembling and producing a mini-newspaper on a scheduled basis. This is a very labor intensive process and demands a significant amount of time and effort on the part of those responsible for writing, assembling, formatting, producing and distributing each issue. Essentially, our methods of dissemination progressed with the times, but it has eventually lead us to a situation of producing an archaic format via far more capable channels. Thus we have come to the point of asking ourselves...what is the goal here? What is the purpose of the newsletter? The fundamental answer, we believe, is that our purpose is to communicate Chapter information in a timely and effective manner with our members and friends. For years a newsletter format has been the method we used to achieve that purpose. Yet the time has now come to step back from this routine and evaluate if a traditional newsletter format continues to best serve our purposes in a world where the flow of information is undergoing a revolutionary shift and newer methods may far better serve our purpose. What has caused us to relook the concept of a newsletter? Besides the time and effort issues mentioned above, the timeliness of a scheduled newsletter is a significant weakness...particularly when it is only published on a quarterly basis. By the time an issue "goes to press", much of the information is already months old...we weren't just producing "yesterday's news tomorrow," but "yesterday's news two months from now." Besides reporting on the previous three months of Chapter activities, the quarterly publishing frequency also demanded that we attempt to schedule future hikes up to three months in advance. This has been a continuous struggle, as hike leaders have found it difficult to forecast their availability for leading hikes so far in advance. Preparing a complete hike schedule on a quarterly basis has thus proven to be a major obstacle to producing newsletters on time. Producing a more frequent newsletter addresses some of these issues and has been tried over the years, but the increased production frequency greatly increased the workload of the editor to the point of being untenable. We believe that moving from a traditional newsletter to a blog format can address many of these issues in a satisfactory manner. Fundamentally, we believe that the internet has evolved into an essential and pervasive communication platform for the 21st Century, similar to the ubiquitous adoption of the telephone in the mid-20th Century. The rapid and continuing evolution of the internet has caused a seismic shift in information access for the entire planet, while a second generation of web technologies (Web 2.0) has introduced a participatory environment which empowers everyone to become not only a consumer of information, but a participant in the production of information as well. Our intent is to take advantage of these new tools and methods to achieve the goal of more timely and effective Chapter communications with our membership. We believe that a blog format can provide a more than satisfactory platform for disseminating Chapter news and other pertinent information. One of the most obvious advantages is the immediacy of a blog. When an article is written by an author, it is immediately published to the blog page and becomes available for everyone to read...no more waiting three months to get the information out! Imagine being able to read a hike report, including photos and maybe even a video, the same day the hike was made! Blog posts are published sequentially in reverse chronological order, so that the most recent news items appear at the top of the blog. Layout of the blog page is much simpler, with adequate tools for formatting and even spell checking included within the blog application. This makes blog posting significantly easier than editing a newsletter. The fact that the publication process is done one post at a time cuts down on the effort of assembling and editing a larger compilation of news articles all at once. Photos and even video can be included at the discretion of the author. The blog software application is accessed through one's web browser, thus all potential contributors have access to the authoring platform...and at no cost! Older blog posts are archived and are always available for access...no more digging through the closet looking for an old issue...and the entire blog archive is searchable. Besides the benefits of easily posting articles in a timely manner, the blog format also introduces the interactive capability of allowing readers to comment on posts. Did the author overlook something of importance in a hike report? A reader can add a comment to provide the missing information. This also allows for the possibility of open discussions on a topic that can be shared by all. We hope that Chapter Members and other hike participants will feel free to comment on our blog posts in order to develop a more vibrant and interactive communication capability. Currently, we envision using the blog to post news items, hike reports and other similar information...we don't currently plan to post the hike schedule here, so that blog readers won't have to sort through the chronological list of posts to find the last published hike schedule. Our intent at this point is to continue to utilize the Chapter website to post the current hike schedule. This is just an introduction to our new Chapter blog. In future posts we will not only report on Chapter activities, just as we have always done in the newsletter (that hasn't changed! ), but we will also introduce techniques for you to gain additional utility from the use of the blog format to make it an even more effective and timely communication platform. We look forward to the challenge! Welcome to our brave new world!